This book caught my eye immediately! 35 Learning Tools for Practicing Reading and Writing Strategies by Cathy Cerveny and Melissa Lacotti is presented in 2 parts - the first on reading and the second on writing skills. For a student striving to master reading there is probably something in this text that will help, as it covers building vocabulary, story elements, comprehension and related strategies. And to improve writing skills, strategies are presented to inform, persuade and express personal ideas - and even revising, proofreading and publishing. I also like the large workbook layout of the text, because it is easy to read with type suited to the younger reader as well as the adult. I highly recommend this text for all those working to bring out the best in students of all abilities! Afterall, we want all kids to succeed in language skills above all - as even math is dependent on being able to read the problems. Details: 80 page paperback published by Teaching Resources. 10 and a half by eight and a half inches. ISBN 0439207614. In Adaptive Dance and Rhythms for all Ages with Basic Lesson Plan, you'll find fun and practical adaptive techniques to teach basic dance movements, floor exercises, clapping rhythms, and expressive dance, either in separate 5 minute segments, or part of the 40 minute lesson plan. Geared for kids and adults with disabilities. Fully illustrated. 76 pages. This teaching text was created from my work as a dance specialist with children to seniors and those challenged since 1965. It is part of The Gateway to Educational Materials of the United States Department of Education, in the Rhythmic Movement Dance Series, as Adaptive Rhythmic Movement by Susan Kramer. Music and rhythms provide inspiration for structured and expressive movement. The clapping, floor exercises, and moving across the floor exercises in this text develop coordination of body-mind through right-left brain development. This theory of receiving input through the bodily senses, body to mind and then mind to body for action, powered by spirited, enthusiastic energy is a basis of somatic education. All levels of mobility will find something useful. Practical hints are given for those confined to bed or wheelchairs or with limited range of motion. I like to call the participants ‘dancers’. Music and rhythmic clapping or rhythm instruments provide the inspiration. For example: Those with impaired hearing can feel the vibrations of music in their hands by touching a piano being played or a sound speaker for a radio, tapes, cds, and some musical instruments; even through their feet on a floor that is vibrating from an instrument being played in the room. 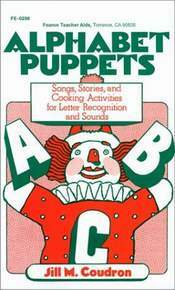 Alphabet Puppets - Songs, Stories and Cooking Activities for Letter Recognition and Sounds by Jill M. Coudron is a 122 page paperback geared for use by parents or teachers with children ages 4 to 8. Teaching the alphabet letters is presented by easy to make puppets who give practical examples through prose and song, and by making or cooking things beginning with an alphabet letter. I think this is also a great book to inspire your own creative ideas, as you can take what’s on your dinner menu and make it into a lesson for an alphabet letter. You can go to the park, see a duck, come home and make a "d" puppet for duck with the visual memory still fresh from the park. Or, you can make a certain letter puppet, go for a walk, and then find something that begins with that letter. On and on. This is a great book for reinforcing everything positive we do as parents. There is no room in these 10 chapters arranged in 4 parts to dwell on the negatives of life. I like the format of each chapter, which begins with a story that demonstrates the lessons or points to be made. And at the end of each chapter a little to-do project gives the reader something to think about - making this an interactive and teaching text, in my point of view. "Recall what adults told you about joy as a child. Was it portrayed as a feeling you had to contain? Imagine a time you felt happy as a child. How did express joy? How do you experience it now? How do you react when your child feels elated?" At the back of the book after all the wonderful encouragement in the chapters there are 2 comprehensive suggested reading lists under the headings Doing the Best for Your Child and Doing the Best for Yourself. I've just given you an overview of The Best Things Parents Do, but it is really chockfull of hints that guide toward bringing out the best qualities and strengths in each individual child. Classical ballet in preballet, beginning, intermediate and advanced levels with hundreds of combinations in 100 pages, including a separate section of pointe work. Basics through advanced adagio and allegro for choreography. The preballet syllabus for 6 to 7 year olds emphasizes rhythms and large motor skill development. The pointe work syllabus begins for students having at least 3 years of classical ballet instruction and at least 11 years old. The advanced level is also a resource for mature male and female ballet dancers to use for daily class or warm-up before performance. Hundreds of classical ballet combinations are included, compiled from my training, performing and teaching experience as a 2nd generation Cecchetti (1850-1928) disciple. This text is in the "Rhythmic Movement Dance Series" and part of the Gateway to Educational Materials (GEM) of the United States Department of Education. I was so happy when I first read Bonnie Sayer's 71 page ebook, "Educational Autism Tips for Families," as I found it to be totally useful in understanding what parents could go through facing the school system with a child on the autism spectrum. And, I imagine kids with other learning disabilities and their parents would face similar challenges, making this a book for all parents whose kids have learning issues. Going through the process and writing about it from first hand experience, in my opinion, makes all the difference in whether a book will be really useful to a family in similar circumstances. Bonnie Sayers has just the qualifications needed to write a handbook helpful for maneuvering through the school system. As she tells us in the text, she has two sons on opposite ends of the autism spectrum. Daily, she sees what is needed for mild help to severe help dealing with the issues that arise in her boys' education and schooling needs. In fact, not just schooling, but paying close attention to all daily living situations. Because, unless children are successfully coping the whole day, they cannot be prepared for the stresses school time brings their way. "Educational Autism Tips for Families" is divided into four main sections that take you through the school day and the school year. It is a comprehensive guide for what your child may face in school while separated from you. It explores what issues a parent should consider; what signs to look for to assure your child is getting the proper treatment, from the time he or she leaves your care until you see him or her again in the afternoon. And there are numerous links to resources to check in further detail for your specific needs. Bonnie Sayers is not afraid to share with us the nitty gritty details she has coped with as a parent in relating with administrators, teachers, aides, therapists and more. I, for one, appreciate the depth of investigation she pursues on the subject of the education of her special boys. All parents struggling in some way to get their child's daily needs met will gain by reading "Educational Autism Tips for Families." How to teach elementary students kinesthetically, in a fully illustrated text, outlining body placement, rhythms, large motor skills, dynamics, creative movement, beginning mini-lessons, and a 40-minute lesson plan divided into 5 minute segments. Also for special needs students. Master text for teachers on how to use a kinesthetic approach with academics. Included in the Rhythmic Movement Dance Series of The Gateway to Educational Materials of the United States Department of Education GEM. A Full Lesson or a 'Sponge' Activity? Fundamentele bewegingen voor kinderen met dansjes, meditaties en yoga door Susan Kramer - 16 Ritmische, basale, motorische vaardigheden, 9 dansjes, 9 meditaties voor ontspanning en 15 zacht bewegende yoga houdingen voor kinderen van alle leeftijden en bekwaamheden. Plaatsing: 477.8 Bewegingsonderwijs; Basisonderwijs; Didactiek. Volledig geïllustreerd, 108 pagina's. Nederlands taal. Perfect for the classroom teacher or homeschooling parents! A great resource for all your learners - visual, auditory and kinesthetic. 13. Learning to Print "b" and "d"
About the author Susan Kramer has been teaching academics kinesthetically as a dance specialist since 1965. How to teach through description and illustration: sitting, walking, dance, relaxation, instant, music, running, swinging, biking and swimming meditations, plus a chapter of guided meditations on virtues, and a chapter of affirmations, inspirations and prayers. For tots to teens of all abilities. Useful resource for parents, educators, and interfaith clergy. 100 pages. About the author: Susan Kramer has been teaching dance, yoga and meditation to kids of all ages and abilities for more than 30 years. The practical application of Helen Irlen's method worked for my family member, so with first hand experience I can recommend taking a close look at the theories purported in her book. Scotopic Sensitivity Syndrome (SSS) or Irlen Syndrome seems to be a visual perception problem in that certain frequencies of light do not pass through the optic nerve smoothly, becoming distorted before reaching the brain. Some of the symptoms of SSS include: sensitivity to light or glossy paper; strain or fatigue while reading; reading slowly; poor depth perception such as having trouble catching a ball. The good news is that through testing, certain colors of lenses in eye glasses or laying sheets of different colored plastic over reading material may alleviate the symptoms. In 100 pages for grades K-12, 16 rhythmic dance steps illustrated and described, plus 9 little dances, 18 sequencing combinations, and 4 more advanced group dances - for kinesthetically learning about math sets, sequencing, and language phrasing and rhythms. Dances can be adapted using a partner or assistant for special needs students. 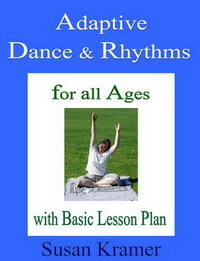 Whether using the "Basic Lesson Plan" or not, teach toddlers and preschoolers rhythms, floor exercises, large motor skills, expressive dance, more than 10 kinesthetic mini-lessons, and full dances in 98 pages with photos and illustrations. You'll find something to benefit most kids of varying abilities and special needs in these pages. A fun way to build essential early skills before kindergarten! Perfect for parents homeschooling, dance teachers, or early childhood education teachers. Island of the Blue Dolphins by Scott O'Dell, winner of the Newbery Medal in 1961 joins our recommended list of books, because of the example of resourcefulness the young girl, Karana, shows in surviving alone. Stranded by herself on an island off the coast of California for 18 years, Karana relies on her inner strength, courage and skills to cope and grow. The author shares what island flora and fauna could be like and this reader was immersed in the pictures of the environment seeing the daily struggles and challenges right along with Karana. Scott O'Dell, (1898-1989), was a prolific 20th century author. Island of the Blue Dolphins was written for children, but he also wrote fiction and nonfiction for adults. Growing up in Southern California he enjoyed the ocean and being outdoors. Coming back to modern times and the elementary school classroom for a moment, a student faced with academic challenges has an opportunity through reading Karana's story of coping and thriving, to see that there is more than one way to learn and grow in life. The story gives hope. It is a particularly appropriately book to read aloud to kids, with the rich description of images. I feel that when one door is closed there is probably another that is opening that makes use of different learning skills, and Island of the Blue Dolphins is a great example. Details - for upper elementary reading level in 192 pages; published by Yearling; ISBN: 0440439884. Subtitled 'Our Lives in the Universe of Autism' this 263 page book is a collection of more than 50 separate experiences from women on the autism spectrum, told in narrative and poetry. With a 5-star rating, the highest at Amazon.com, this is an invaluable resource for those faced with autism or Asperger's in their own or a family member's life. By hearing these adult women share their experiences, we see that autistic children face a lifetime of learning how to live in society, and more importantly, how to find a means of expressing their true selves - from the practical to the spiritual. I also found the Glossary of terms used on the spectrum an invaluable resource for understanding the terminology used in describing symptoms of Asperger's and autism. For example, it clarified for me what the little word stim is - shorthand for self-stimulation. Reading "Women From Another Planet?" has given me a clearer view of what a woman on the autistic spectrum experiences as an adult in the roles of wife, mother, single woman, and in the workplace. The editor, Jean Kearns Miller, did not find out she was on the autism spectrum until 4 years after her son was diagnosed with Asperger Syndrome. Ms. Miller, in putting together the stories in this book is writing from firsthand experience and who better to let us know the day to day reality of living on the austism spectrum. I recommend it as a worthy addition to understanding the daily challenges this learning disability presents at any age. Traditional yoga poses and meditation techniques have been adapted to help foster motor skill development, coordination, concentration, and stress relief for children, teens and adults of varying abilities or special needs. The elements can be used as a group activity, or practiced individually. 18 how to live social skills, and a dictionary of 40 one-sentence hints for happiness complete this book of techniques, providing a broad offering of yoga's nurturing. A useful resource for parents homeschooling or teachers that want to bring harmony back into the classroom! I recommend this text as an all-around resource with kids of all ages and abilities, as well as for adults to follow. After all, it is probably the parents who are reading the book first before giving it to their kids to browse through. It has my highest recommendation, therefore, for all ages - for the kid in us all. Susan Kramer has been teaching meditation, yoga and dance to students of all ages and abilities since 1965. DISCLOSURE: I am an Associate of Amazon.com and bought my own products.